Feelings: You can always expect a long line at culitish Thai empire, Pok Pok even after they moved to more spacious place. Now that they are open for weekend lunch, there should be less chance for a wait this summer--Most people will be at Smorgasburg at Pier 5 nearby instead. We really enjoyed Smorgasburg in DUMBO last year, but this year's Pier 5 version attracts monstrous crowds and becomes a bit difficult to navigate. (Ramen Burger is there..) So if you are defeated by the blistering sun and crowds, walk down on Columbia Street to Pok Pok instead for lunch. Pok Pok has the pedigree and name recognition (Mr. Ricker) that attracts foodies and Manhattanites to this developing area of Brooklyn. 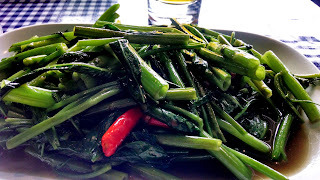 Compared to other well known cult Thai restaurants in the city such as Sripraphai, Ayada and Zabb Elee, the menu is more difficult to navigate which creates the uncertainty of flavor and dish we are ordering. However, the drink menu is defined with a list of unique cocktails, whiskey, scotch and beer. For no-proof drinks, Thai favorite, drinking vinegars ($5) is highly recommended. The ginger drinking vinegar is refreshing and a great alternative to ginger-mint lemonade in summer. Also, the water here is flavored with pandanus leaf as it is done often in Northern Thailand. It tastes a lot like rice water, and it is supposed to have cooling and soothing effects. 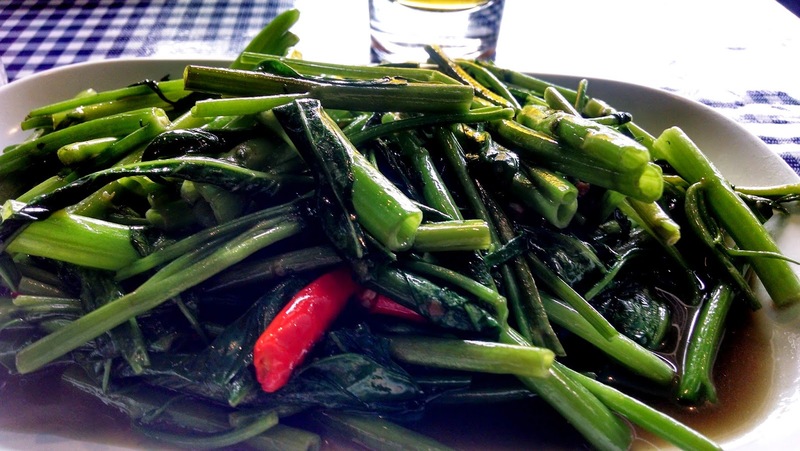 The Phak Buung Fai Daeng ($10 "red fire water spinach") is excellent and fiercely garlic-y. The side of sticky rice ($3) truly balances out the strong flavors. If you are unable to finish the dish, I don't recommend you take it home. The take-out container leaked its tasty sauce filling all over the bag. By the time I got to Atlantic Avenue, I left a trail of stinky garlic smell. 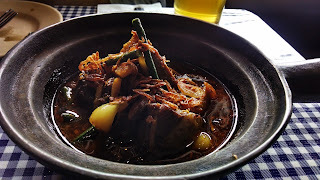 Kaeng Hang Leh ($16 Northern Thai sweet pork belly and pork shoulder curry, RICE NOT INCLUDED!) was delicious and tender fatty pork belly. I do recommend you add a side of rice to soak up the delicious left over sauce. With remarkable flavors and drinks, Pok Pok creates an interesting culinary experience. The dining experience seems somewhat similar to looking through your friend's trip to Northern Thailand on Facebook--and here, actually food comes along with it. As a restaurant, it lacks the thoughtfulness towards the customers as it is completely one way, but what they are sharing with us is a superb and delicious experience.